Pushcha: Your Beatitude, your visit to the Russian Orthodox Church is coming to an end. How would you begin summing up the visit, its essential outcome? +Jonah: Most important, of course, is a personal contact with Patriarch Kyril and other representatives of the Russian Orthodox Church. In addition, this visit fortified me with grace. I prayed before many sacred sites, visited many monasteries, venerated the relics of many saints. What topics were the primary subjects of discussion during your talks with His Holiness Patriarch Kyrill? We discussed how to serve and continue to work together. During this discussion, we noted that among us there are no major problems, although some general difficulties in Orthodoxy world-wide do exist. It seems to me, however, that we are both of one mind. How would you rate the overall level of interaction between the American and the Russian Orthodox Church? The American Orthodox Church is the former “daughter” of Russian Orthodox Church, who now is like our older sister. We have no difficulties in our relations with her. Here we are perceived as a fully canonical and autocephalous Church. This is logical because the Russian Orthodox Church and granted us autocephaly. I am received here on the same level as the Patriarch himself. If we were not perceived as a fully independent and equal Church, then I would be received here as I am. Quite recently, the Orthodox Church in America found its new leader in your person. The resolution of which issues do you consider most urgent for the American Orthodoxy? And how does this tie-in to the new challenges now facing the Russian Church? Our most important problem, such as the troubles associated with funding, can be said to be behind us. But the main objective, which is still before us, is preaching the Gospel in America; implementing our mission so that Orthodoxy would spread throughout the country; interacting with other churches in America. Another important task – it is to start new monasteries in America. It is one to which we pay great attention. I would like to mention the desirability that our clerics participate in the church-wide postgraduate education program, which the Patriarch Kyrill assigned to Vladyka Hilarion, Archbishop of Volokalamsk, to establish. What outcomes do you expect from the forthcoming conference in Cyprus, during which, among other things, the unity of the American Church is to be discussed? Are you counting on the Orthodox Church in America getting a greater measure of understanding of her position by other Local Orthodox Churches? The Patriarchate of Constantinople, as well as some other Local Orthodox Churches do not recognize our autocephaly. And if they want to make any decisions affecting our life, this is only possible with our consent. Otherwise, it will be a great sin against us. Do you intend to take further steps towards a dialogue with the Patriarch of Constantinople on recognizing the autocephaly of the Orthodox Church in America? Of course, I would like this very much. That is my position. But I also want to be honest with the Leader of the Constantinopolitan Church and under no circumstance wish to show any lack of respect towards him or to say anything against him. But the position of the Patriarch of Constantinople concerning us seems to me to be wrong. 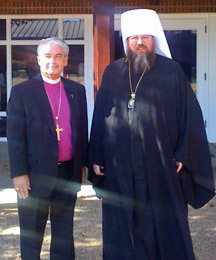 Patriarch Kyril and Bishop Hilarion provide us with constant support in this matter. It is a not a question concerning not only us but also the relationship of Moscow and the Constantinople Patriarchates. The Moscow Patriarchate granted us autocephaly. This very decision contested is the Patriarch of Constantinople. Your Beatitude, please tell our readers about the American Orthodox Church: What is the size of its flock, and what is its composition? What place does it occupy among the other Orthodox jurisdictions in America? We have about 650 parishes and 25 monasteries. Our communicants number about 100,000 people. The baptized — about one million. The Greek jurisdiction embraces about 125,000 active members and nearly 400 parishes. But their congregations are very large, much larger than ours. They also have more among the baptized — about two million people. The Antiochian Patriarchate has about 225 parishes and about 50,000 communicants. The Serbian Orthodox Church has around 100-150 parishes, I do not know exactly. About sixty percent of our flock are Americans who have accepted Orthodoxy. 30% are former Uniates, and about 10% – Russian emigres. We have so many Americans because a significant portion of our flock consists of the residents of Alaska and Mexico, many of whom are Indians. We are not a Russian Orthodox church; we are a Local Orthodox Church, which accepts all and is open to all. Therefore, although a part of our flock consists of Russians, they do not constitute a majority within it. However, now we are now considering the issue of having the representative of the Russian Orthodox Church also take part in meetings of our Synod. Your Beatitude, the recent change of President of the United States and the economic crisis is likely to be accompanied by changes in the general life of the country, in the mindset of people. How do such changes effect the Orthodox Church in America? What may the American Orthodox expect in the near future? For all of us – both there and here – this time very difficult. We also survive on free-will offerings, but we do not have a system of sponsorship [underwriting], such as exist in Russia. Currently, as a result of the crisis, our free-will offerings are off by about 20%. We have no special relationship with the U.S. government. Relations between church and state are entirely different in America. What does monasticism in general and the Valaam tradition in particular mean to you as bishop and Church Leader ? For an important part of your visit is a pilgrimage to the shrines of Moscow, the Trinity-Sergius Lavra, St. Petersburg and, of course, Valaam, to which much in your life is connected and for which you have done much. What are the general features of monastic ministry in American Orthodoxy? The Valaam tradition, of course, is very, very important to us. In Valaam, I received my spiritual formation; I am conscious of this and try to pass the received tradition to others. When I founded a monastery in California, knowing Valaam’s tradition helped me. I was given very good advice by the monastery’s Hegumen, the current Bishop Pankratiy and by Elder Kyril (Pavlov). I was supported and strengthened by this. Now I want to start a new brotherhood in Eastern America. It will also be based on Valaam traditions. Vladyka Pankratiy said that we must look to our spiritual roots. In America, we must look to Russian traditions. In Russia, in turn, they look to Athonite spiritual traditions. Many people in the West came, and continue to come, to Orthodoxy via their familiarity with Russian literature, music, icons, theological thought. What role did Russian culture play in your life? For me it was very important. My first meeting with Russian culture was by reading “The Brothers Karamazov”. Here I first became acquainted with Orthodoxy, but at the time I did not yet met any Orthodox persons. I was also heavily influenced by the books of Vladimir Lossky, especially “The Mystical Theology of the Eastern Church”. I started to read this book and realized that I needed to become Orthodox. I was 18 years old at the time. For me it was an intuition of truth. And how did you establish contact with the Orthodox Church in America? I found the phone telephone number of a Russian church. It was a parish of the Church Abroad. I called and went there. I came to the church, looked, but did not understand a single word. I went to a Greek Orthodox church; was very well received there, but I was told: “Why you are here if you are not Greek”? And in the Serbian church, I said: “Why are you here if you are not a Serb?”. Later I met a priest from the Moscow Patriarchate, a Mexican, a very good person. He was named Roman Merlos. He devoted a lot of time to me and helped me to accept the Orthodox faith. And I am very grateful to him. What primarily is lacking in other U.S. Christian denominations who decide to accept Orthodoxy? For several months Metropolitan Jonah has been privately expressing his interest in establishing a new monastery on the East Coast of the USA, most likely envisioned for the greater Washington DC area. It has been spoken of most often as a women’s monastery, under some form of spiritual guidance of the well-known Greek Archimandrite Dionysius (Kalabokas), with whom the Metropolitan has had close ties. As the OCA itself has few funds (as the Metropolitan relates, giving is down 20%) it is expected that the Metropolitan will seek a wealthy donor to acquire the land and initial buildings, should the dream be realized in the near future.